Of all of man's technological accomplishments, nothing matches what he has done with computers and the Internet. Web technology has advanced so much since my youth, the days of green-screen computers and 1200-baud modems seem like the Stone Age. The microwave oven has improved over the years, but we didn't go from taking an hour to warm up a cup of coffee to cooking a twenty-pound turkey in thirty seconds. People used to talk about the miracle of the jet age. In 1903, Orville and Wilbur Wright made their first controlled flight, going about 7 mph. It took about twenty years before many could travel over 200 mph. In 1947, Chuck Yeager broke the sound barrier with a speed of 670 mph. In the 1960s, planes reached twice the speed of sound at 1,200 mph. The speed race came to an end in 1976 with the SR71's ability to travel 2,194 mph. Since then, we have actually gone backwards. The SR71 has been decommissioned without a replacement. The exponential growth curve in the computer world shows no sign of ending. In 1971, the CPU for a computer had 2,300 transistors. Today, the same CPU has over 2 trillion. When Rapture Ready started in 1987, our monthly bandwidth limit was 25 megabytes. Today, we have a monthly limit of around 40 trillion bytes of data. The growth in the web domains and users has also had a sharp growth spike. The number of web users is growing so fast, it's likely that the majority of earth's population will be using it in the next few years. The only limitation is people's ability to afford access to the global on-line community. In 1991, there were hardly any websites on the Internet. By 2009, there were over 200 million. As late as 2001, only 360 million people were using the Internet. As of September 2009, more than 1.7 billion people regularly use the Internet. The Internet is the modern equivalent of the printing press. Everyone has the ability to be a publisher and share his or her voice with a global audience. Just as junk mail has become the bane of the printed world, junk information has been filling the web. When the web first started, it was much easier to find resource material on various subjects. Today, one has to wade through a sea of garbage to find useful information. The web is clogged with ads of every form, broken links, and pages that are self-serving to the company or people who produced them. There is such a clutter of useless sites, I turn to trusted bookmarks for many of my inquiries. One of the key factors that turns the net into a garbage dump is people's self-interest. They’re either trying to sell something or they ramble on about themselves. Millions of websites are part of hit farms. Their only purpose is to coax people into clicking on their links, which are ads made to look like useful information. Even well-meaning Christians can add to the trash pile. I recently found a blog by a woman suffering from MS. She started the blog to benefit others. Rather than being a testimony about the sustaining power of God in trials, the blog was a random collection of trivial thoughts on things like the weather, shopping, and food. The Bible was only referenced once. This person seemed to think that the world is dying to read about her aches and pains. I was once at a conference in Dallas, and an author asked me if I would add his website to our link page. Later, I checked it out and was shocked to find this huge site that was solely focused on promoting a book he had written. It was one of the most egregious examples of self-promotion I had ever seen. Just like the blog example, the Gospel message was nowhere to be found. I think we need a Smokey-the-Bear-type of mascot to ask people not to pollute the web. You don't throw litter out of your car window because you know it will degrade the environment, so why should people throw trash into cyberspace? There are many reasons the Internet is lacking a good Christian witness. I was going to list several of them, but decided to focus on what I think is the key problem at hand. The reason we lack an effective approach is that the Internet has made everything too common and too accessible. There is no value in doing the Lord's work online. The factor has had a similar impact on the Bible. At one time, the vast majority of people did not own a copy of God’s Word. Until the invention of the printing press, each Bible had to be transcribed by hand. Today, I have dozens of Bibles around the house. You can go to a discount store and find piles of Bibles that were mass-produced in China . For a buck, you can also buy a digital copy of the Bible. Its amazes me to think that a Bible file only take three seconds to transmit to someone with a cable modem. During the Middle Ages, it would have taken three years to produce the same text for someone wealthy enough to afford one. The accessibility of the Bible has not improved the average Christian’s understanding of the Holy Word. Christians today have far less understanding of Scripture than people who only know the Bible from what they heard in church. In the early Church Age, people would invest their whole lives in efforts to send the Gospel to various nations. Today, you can reach over 140 nations in a single month through a web connection. A congregation would rather build a new daycare center than spend a few bucks on a better website for their church. Any large Christian organization could be the one-stop source for Christian information if it wanted to spend a few million dollars of their budget. Thousands of ministries have an annual income of over $50 million, and the vast majority spends less than $5,000 a year on their Internet budget. When Yahoo.com first came out in 1994, it had a directory-based format that listed similar domains together. RR was under "Bible prophecy" with several other end-time sites. I saved the list, and one time I checked the links. To my surprise, 90 percent of the sites from around 1997 no longer existed. The owners lost interest and closed up shop. When the Internet was brand new, everyone was thrilled by the idea that hundreds of people were visiting their boards. Many sites would list all the countries represented by people who registered on their traffic counter. Today, the web is so pervasive, nothing is special about the fact that someone from China, for example, passes through your domain. The good thing about the lack of value in the web is that it separates the devoted Christians from those who don't really care. Whenever I want to measure the dedication of a certain ministry, one area I always check is how well they maintain their website. One key factor that has made Rapture Ready so successful as a prophecy site is that our focus has been to use the web as a vehicle to offer Bible-based information to as many people as possible. We target questions that people might pose when they come to the net looking for answers. Whenever I get ready to write on a subject, I always first do a search to see if some other site has covered the topic. Most of the time, I don't find anything that comes close to what I plan to write. I do have a unique way of approaching some subjects, but I think the bigger factor at work is that most people only care about content that suits their personal interests. For example, millions of online articles tell you what’s wrong with the world, but only a handful of articles offer advice on how to fix the problem. 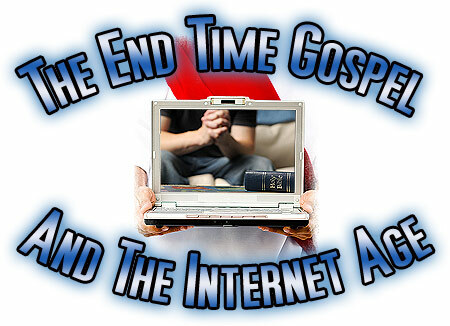 I didn't find any relevant matches when I typed in the title of this article, "The End-Time Gospel and the Internet Age." One guy had something close, but he only went to a book he was trying to sell. Because this page is an answer to an inquiry on the subject of the Gospel and the Internet, it will naturally soar to the top of the search list once I upload it. What makes the Internet such a wonderful tool for reaching the lost with the Gospel message is that fact that you are offering information to the public at almost zero cost. In the world of books, DVDs, and CDs, you can't find production costs that are lower than a dollar per unit. Once a book's sales have dropped below a certain level, the publisher removes it from its catalog listing. The Left Behind novels written by Tim LaHaye and Jerry B. Jenkins were part of one of the most successful series in the history of Christian media. In the publishing world, however, all good things must eventually come to an end. One day I was at a dollar store, and I saw the tapes for some of the Left Behind books available for sale. There is no bargain bin for websites. A web page can remain active for an indefinite amount of time. Some articles on RR have been around for nearly two decades. Each month, they are visited by several thousand people. "But in your hearts set apart Christ as Lord. Always be prepared to give an answer to everyone who asks you to give the reason for the hope that you have" (1 Peter 3:15). A fundamental duty of every Christian is to share his or her faith with the lost. I firmly believe the Internet is one of the best ways to fulfill this obligation. If the 80 million professing Christians in the U.S. added one page of content to the net, nonbelievers would be repeatedly exposed to their witness. I would be happy if one-tenth of that amount did something productive. The vast majority of Christians never do anything. We are told to pray for others, but we don't even bother to pray for our own needs. I would estimate that less than two hundred individuals are responsible for producing 90 percent of the prophetic content on the net. There is little interest in God’s business because most Christians don’t see the reward. Most of them are more worried about making money here on earth than they are about adding to their heavenly bank account. The wonderful thing about doing something is that once you invest the time to do it, you put yourself ahead of a long line of people who do nothing. With a little effort, you can become the 201st person to share the claim to the 90-percent portion of the end-time pie. Rapture Ready has long had an open policy on posting the works of other authors. You don't need to create a whole website. You could spend all the time you need writing on single article and then send it to us for posting. Once you have a witness on the web, you can have the satisfaction of knowing that every month, hundreds of people are reading your material and being guided to the truth. "For thou shalt be his witness unto all men of what thou hast seen and heard" (Act 22:15). I'm sure you have seen one of those infomercials that offers you a bonus amount on some type of cheap product. After telling you about the wonders of a set of plastic storage containers, the announcer says, "But wait! Act now and we will double your order." Well, I'm about to double, triple, quadruple, quintuple, sextuple, septuple, octuple...your potential reward. The windfall is so great that I have no idea how high it even reaches. A few years ago, I wrote an article called "The Master Plan." It details what will happen when billions of people realize they have been left behind and turn to the web for answers. During a short period of time, an article that may have only been read a few hundred times could receive hits that number into the millions. When the Lord Jesus comes to earth to remove the Church, I strongly believe the Rapture will generate one of the greatest panics in human history. The intense need for information will cause millions of people to turn to the Internet for answers. Because Rapture Ready is so closely related to the subject, a huge number of people will find their way to this domain. Currently, only about 0.00115 percent of global Internet users visit our site. I would not be surprised if 20 percent of the post-Rapture population eventually reads an article from RR. The only limitation will be the ability of servers hosting RR to distribute data to the eager public. It is never too late to become actively involved in works that are pleasing to God. Even if you're ninety years old, you still have time to make up for lost time. To share in this wonderful opportunity that the Internet offers, you need to act. I started RR twenty-three years ago by asking myself a very basic question, "Until the Lord comes, what should I be doing?"